With a playoff berth within reach for the first time this season, Texas punched their ticket in dramatic fashion with a 4-3 come from behind victory against Rockford tonight. The Stars scored first but saw the IceHogs jump ahead 3-1 by the end of the second period. The final frame was all Texas as Joel L'Esperance one-timed his first professional goal past Matt Tomkins for the game winner with just under three minutes left. "We scored a big goal to get back in it," said Coach Laxdal. "Morin make a heck of a pass and Joel [L'Esperance] got good wood on it. He's had some good looks and hadn't scored yet so it was good to see him get the first goal tonight." It was a sellout crowd in Cedar Park, which helped Texas jump back into things after Brian Flynn scored his 17th of the year early in that final frame. The end of the second showed a lot of good effort from Texas but Tomkins was up to the task for the IceHogs. Coach Laxdal told his team in the locker room during the second intermission, "If we can score in the first five minutes, it will take a little bit of pressure off our group." Flynn's breakaway tally pulled Texas to within one. After last night's less than ideal special teams outcome, the Stars got a big power play goal from Roope Hintz to tie the game at three. Brent Regner also scored the game's opening goal on the power play in the first period. "It was good to see our special teams respond tonight. Last night we weren't happy with them." L'Esperance scored that first pro goal just three minute later off Travis Morin's 50th assist of the season. Texas fought off nearly two minutes of 6-on-5 hockey to earn the win. With Stockton losing to San Jose out west, the playoffs were clinched with those two points. Landon Bow stopped 22 of 25 shots against for his 20th win of the season. 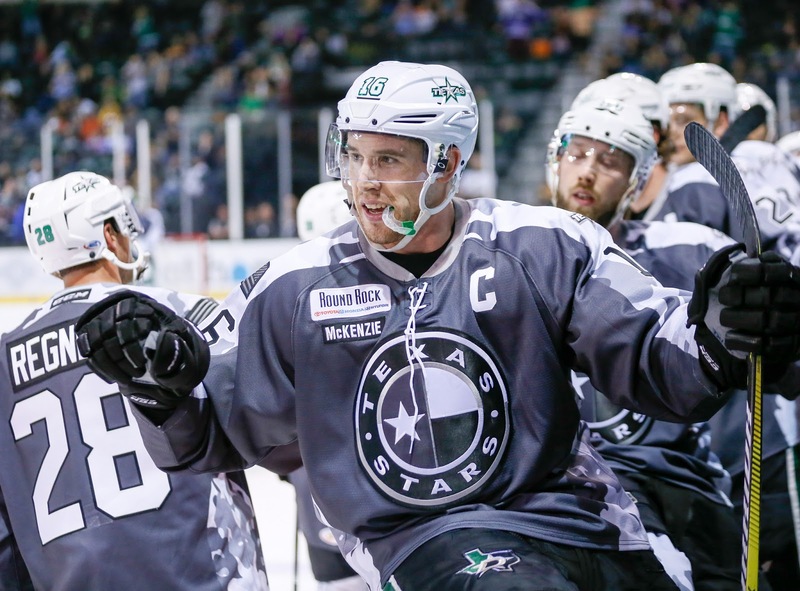 Texas stays at home to play Grand Rapids on Wednesday.